Italy will host the Ryder Cup for the first time in 2022 at the Marco Simone course in Rome. It will be the 44th edition of the biennial team tournament between Europe and the United States of America. Europe has held the event outside of England on only five other occasions - Muirfield (1973) and Gleneagles (2014) in Scotland, Spain (1997), Republic of Ireland (2006) and Wales (2010). Europe defend their title in Minnesota next year before France hosts in 2018. Italy beat Austria, Germany and Spain in the bidding process. 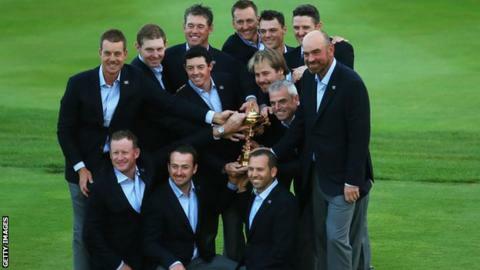 European Tour chief executive Keith Pelley said: "History has shown time and again that the Ryder Cup is pure theatre with the players the stars. "There is no question that the Eternal City of Rome will provide a wonderful backdrop for one of the great occasions in world golf. "We have exciting plans for the development of The European Tour and our international schedule for the benefit of all our players, and Italy shares this ambition. "Their commitment to the Italian Open will provide an inspiring benchmark." The Marco Simone course, 17km from the centre of the Italian capital, will be reconstructed to meet the standards for the tournament.